You can use other flours that you have, or use more of the available ones. The water absorption is different for each flour, so you might need to add a few Tablespoons more water, or more flour. 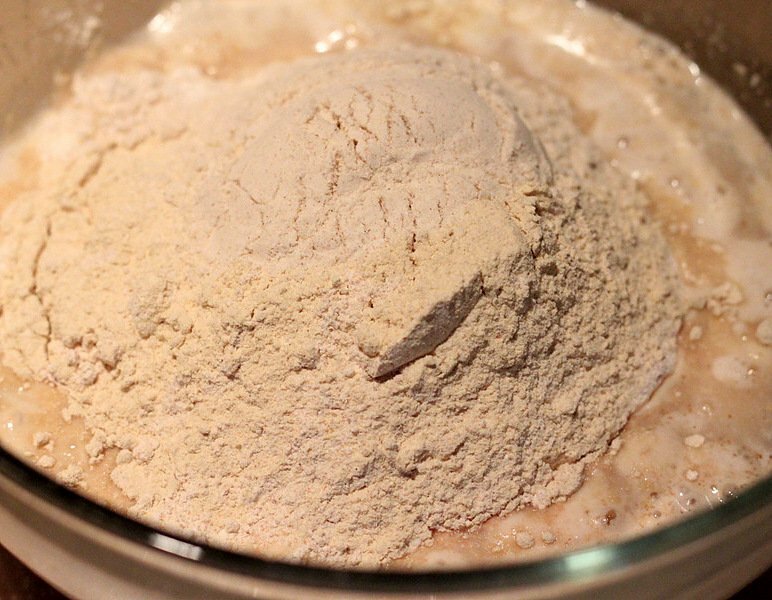 Mix flours and yeast mixture for a minute, If the dough appears too sticky, add flour, if too dry and crumbly, add water and knead again. After kneading for a few minutes, it should be a soft, somewhat sticky dough and not stiff or not batter-y sticky. I decided to keep these buns in the neutral territory. The recipe has variation options listed if you would like to make them savory or sweet. How do you like your bread? 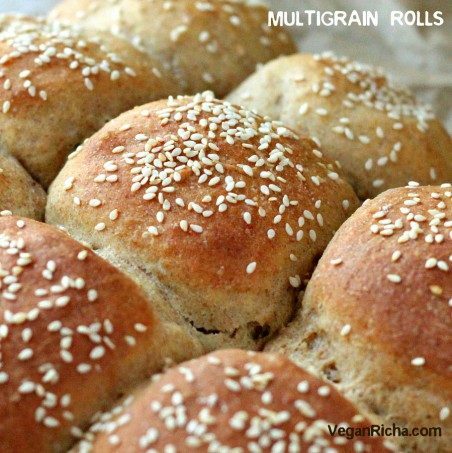 These buns can be eaten as is with some hummus, non dairy butter(yumm), extra virgin olive oil, PB and J, nut butters, with soups and more. They are also very sturdy to make burgers. The size on the pictured buns is more for a snack slider. 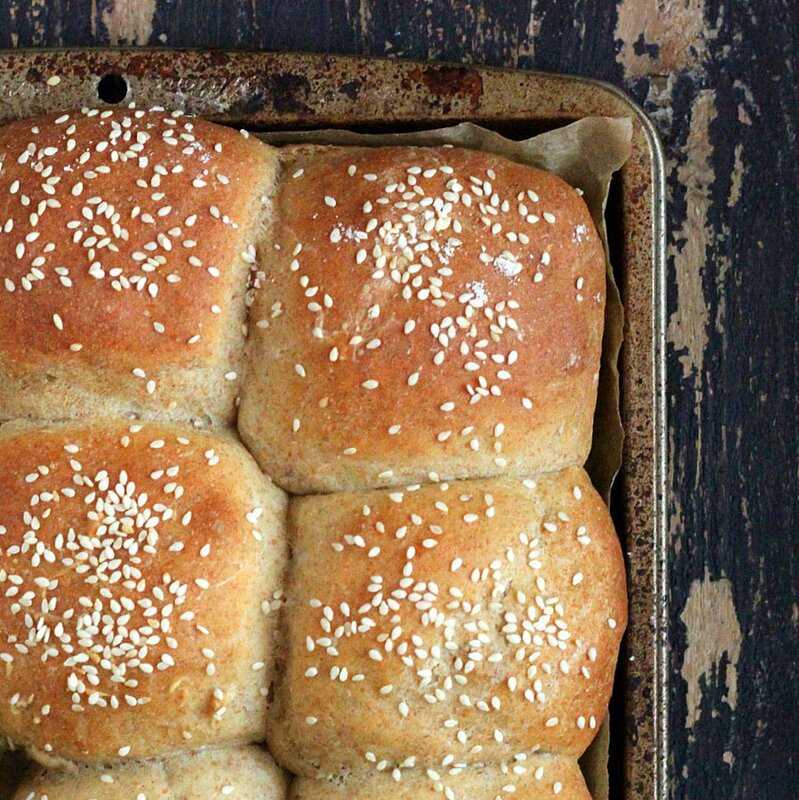 You can make about 4-5 larger burger buns with the dough. For more Bread, buns and the lot see here. For Glutenfree Breads, buns and the lot see here. 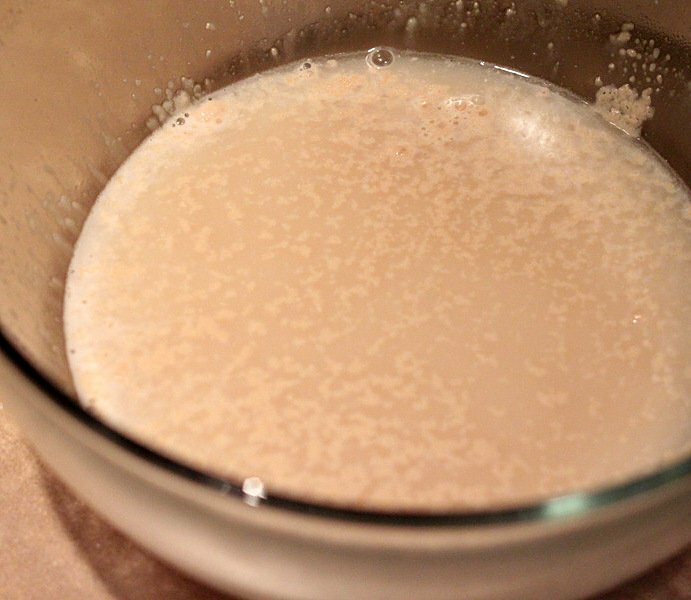 In a bowl, add warm water, yeast and sugar. Mix well and let sit for 10 minutes or until frothy. Add the flours, salt, wheat gluten and oil or yogurt. Mix with a spoon until well combined, then knead for 2-3 minutes. Use more bread flour if needed to make a soft not too sticky dough. Spray water on top, cover with towel and let sit for 1.5 hours or until doubled. Using 2 or more Tablespoons bread flour on your hand and on the dough, punch it down and knead for half a minute. Divide into 6-7 equal portions and roll into balls. Place balls half an inch away from each other on parchment lined sheet. Spray water on top. Sprinkle Sesame seeds or other seeds of choice on top. Cover with towel and let rise for 15 minutes. Bake at preheated 365 degrees F for 25 minutes. Variations: To make sweeter version add 3 Tablespoons more raw sugar and spices of choice like cinnamon, chai spice. To make Savory add chopped herbs, garlic powder or onion flakes, 1/4 teaspoon more salt, or roll up some fave pesto in them. Add all the flours, salt, wheat gluten and oil/yogurt. Mix with a spoon until well combined, then knead for 2-3 minutes. Use more bread flour if needed to make a soft, not too sticky dough. Or add everything to stand mixer and knead at bread dough speed for 5-6 minutes. Using 2 or more Tablespoons bread flour on your hand and on the dough, punch it down and knead for half a minute. Divide into 6-7 equal portions and roll into balls. You can shape by making small rectangles of the divided dough and rolling them up like jelly roll, or pulling on all sides and tucking under. Place seam side down. 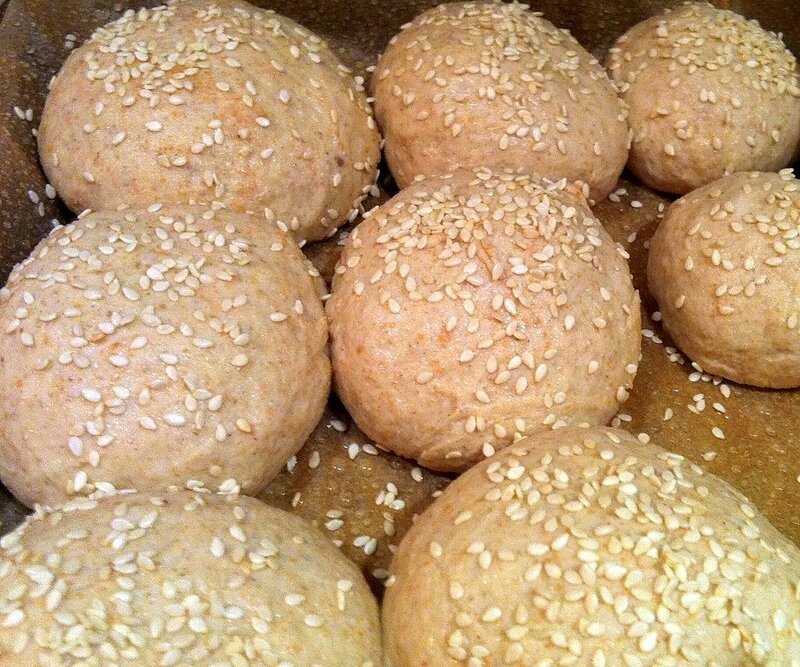 Place balls half an inch away from each other on parchment lined baking sheet. Bake at preheated 365 degrees F / 180ºc for 25 minutes. Take out of oven, let sit for 2 minutes. Break apart, slather with evoo or earth balance and gobble it all up. 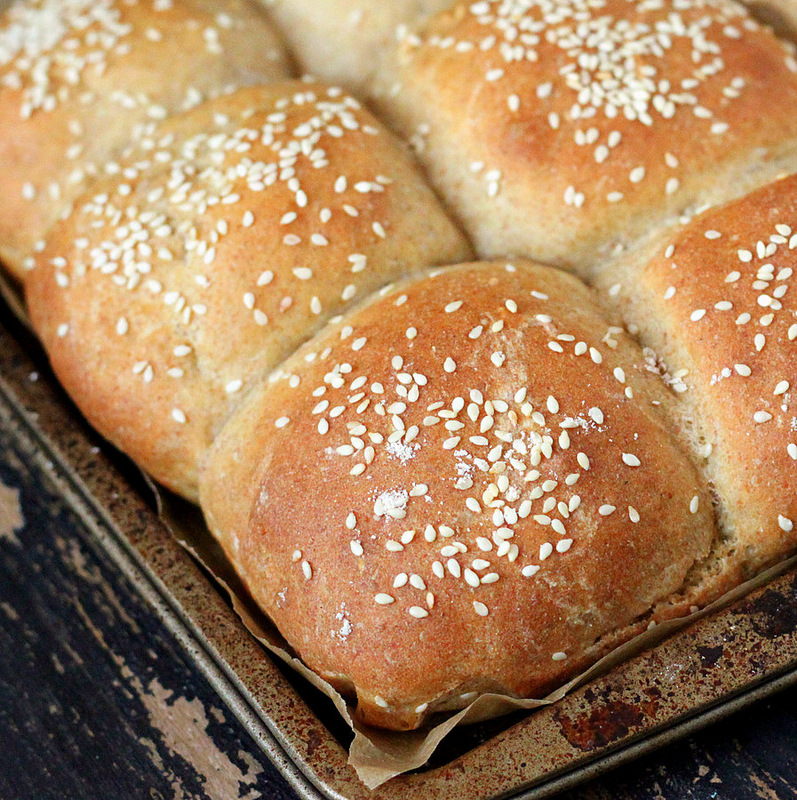 Looks amazing..my kiddo can’t handle multigrain, can I just do wheat sorghum and bread flour?? Yes. 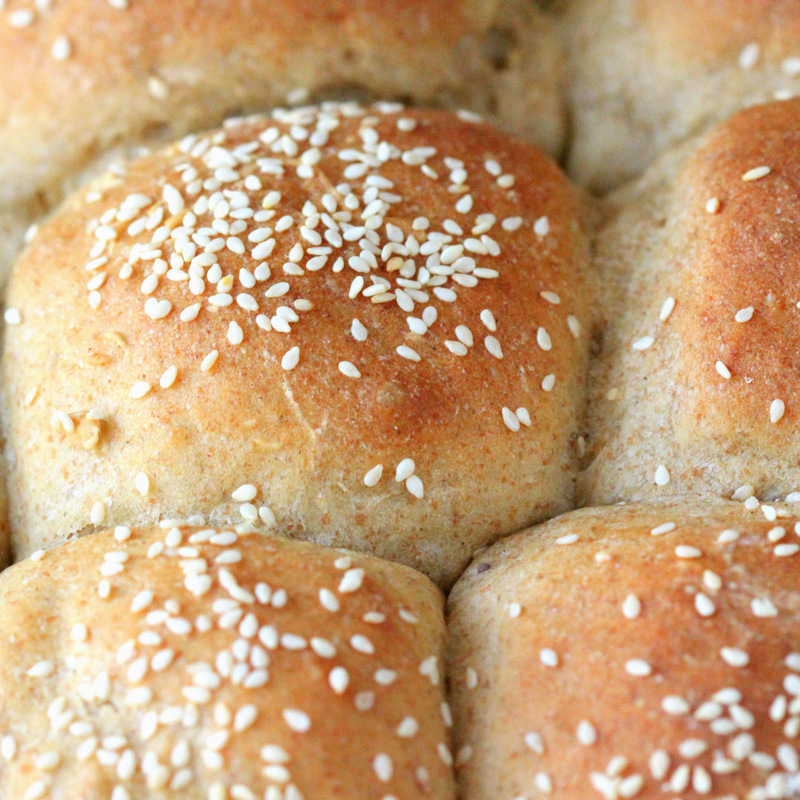 use the same amount of bread flour and add as much wheat or sorghum. knead for a minute and adjust flour or water if needed. not dry stiff and not too sticky dough is what you want to get after 5 minutss of kneading. Thanks Richa for this recipe,Its so healthy esp. I liked you use water while baking. Every so called health or “self style” ayurvedic cook fashionably declare milk with salt in baking “tartlets” which according to ayurveda is a toxic combination. Its simple science of breaking of enzymes. Your recipe is our dinner tonight. Great. Let me know how they turn out. I can smell some again in my house too! I want these and a big bowl of stew now. 🙂 I bet the house smelled wonderful when you pulled these beauties out of the oven! So golden brown and utterly delicious! 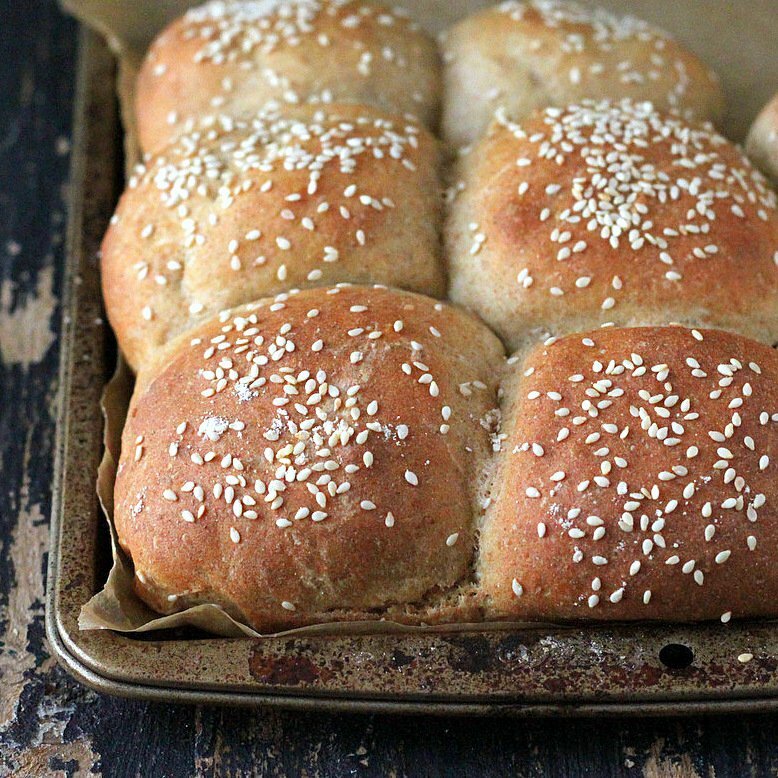 I always skip the bun when I make burgers, opting instead to just eat them like plain patties or wrapped up in sturdy greens… But these buns could convince me to go back to bread. They look incredible! looks amazing.. Perfectly baked.. very tempting.. Love this mix of all the grains here! They’re so pretty, it must be difficult to actually start tearing into them! I’m sure I’d overcome my reservations pretty quickly though. And savoury bread over sweet every time! the rolls are looking great. i have some premixed organic multi grain atta, so will try baking breads from it. they look so fluffy and soft, richa! i’d love a couple fresh from the oven, smothered in earth balance. I’m amazed at how puffy these look. We live at really high elevation. I struggle to get whole grain breads to not be as dense as a brick. I’ll have to try these and see how they do! These look simply perfect! You have no idea how much I’d love to be able to reach through my screen and grab one — they’d be perfect with all the soups I’ve been eating lately! Another great reason not to buy store bought buns. Fabulous looking buns! What a great idea! I always want to make veggie burgers at home but I hate buying buns from the grocery store! I just stumbled upon your website – and it has great recipes! 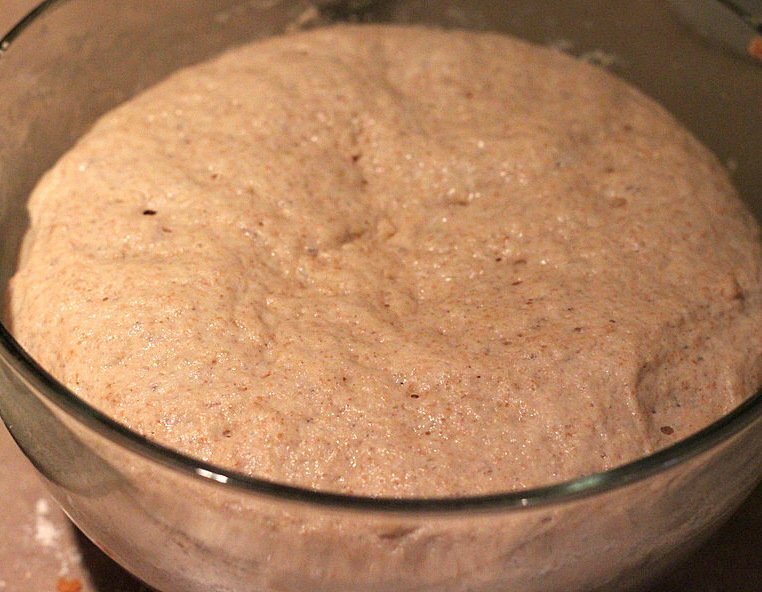 i have a question – while baking breads – is there a substitution for yeast? not for yeast breads and buns. you can use baking powder to make quick breads and rolls, but the recipe would be entirely different. the baking powder bread doesnt need rise time, the liquid needed would be very different and it is a completely different taste and texture. Hi, I made this recipe and the buns were very light.this will be our multigrain Pav recipe from now.thanks for the recipe. I’m please to see the manufacturers of one of the best brands of flour here in the UK (Dove’ s Farm) appear to sell all the types of flour you use about (they give them different names though – traditional names- such as ‘einkorn’ for example). All however are wholemeal versions. Wholemeal wheat, wholemeal spelt, wholemeal strong bread flour etc. In fact I’ve never baked with processed refined white flours at all and don’t really want to start. Are the flours you use above eg bread flour, wheat flour, spelt flour etc, the wholegrain versions? And what about your other recipes? I see you use all sorts of flour – spelt flour, rice flour etc but I really don’t know if you are referring to the wholemeal (wholegrain versions) or not. I won’t attempt to start following your recipes until I know as it will make a crucial difference to the results. In general, whole wheat flour or 100% whole wheat flour in the US would mean whole meal wheat flour in the UK. Depending on the country or brand, the entire grain is either milled together, or separated (into Endosperm, bran, and wheat germ) and milled and mixed back in to make the wheat flour. Even if the flours that I and you use, are milled exactly the same way, say the entire wheat berry is milled, the wheat might still be different. There are several types of wheat and some can be local to the country or region. So there can be adjustments needed in any baking recipe because of that. 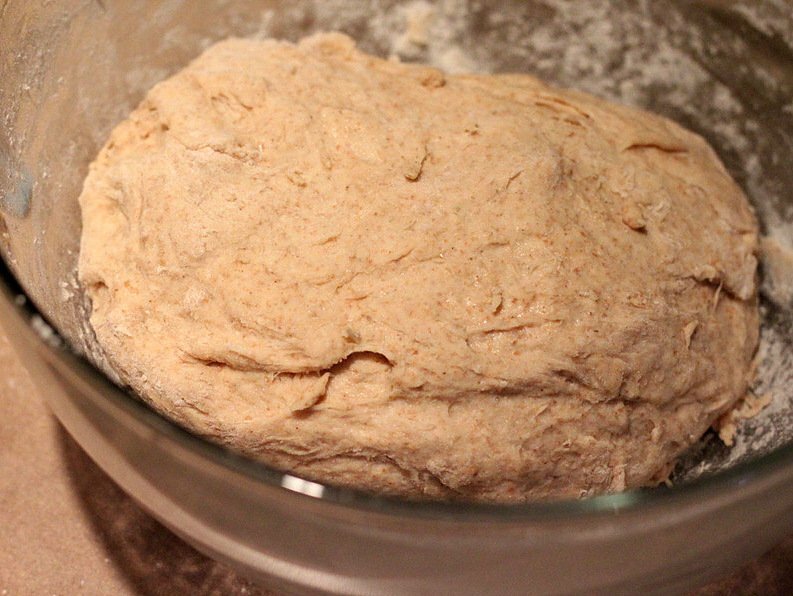 For bread baking, you can adjust the dough during the kneading. There is quite some time and leeway at that point. If the dough is getting too stiff, add more water and incorporate it slowly. If the dough is too sticky, add some flour, a bit at a time. You want a smooth and soft dough at the end, which is also a bit elastic. A few tablespoons of liquid or flour difference from the recipe is ok. I clearly ‘knead’ to stop worrying, to roll up my sleeves and get going then…..